Based in London, Lily Paulson-Ellis Interior Design offers a design service that is tailored to each client’s individual tastes and needs whether the project is a full refurbishment or a one room re-fresh. Lily aims to take the stress out of the project for her clients; ultimately delivering a design solution that reflects their personalities and where style meets practicality. After a successful career in the Private Collections & Country House Sales & Furniture Department at Christie’s, Lily re-trained at KLC School of Design where she was able to fully focus her lifelong passion for interiors before joining Taylor Howes Designs. There she worked on a number of high-end private residential projects in Kensington, Chelsea and Knightsbridge before branching out on her own. Lily has subsequently worked on several properties in and around the Royal Borough. Lily’s background in antiques and her subsequent experience with luxury contemporary interiors influence her eclectic style, which balances old and new, blending luxurious and more rustic elements and ultimately creating an approachable and liveable home for her clients. Rooted in the Scandinavian design ethos, Cat Dal Interiors strive to create interior spaces that maximise happiness and improve the daily lifestyle of their inhabitants. Beauty and functionality underpin our work, providing the framework upon which to carefully layer colour, pattern, texture and a curated mix of old and new for a unique & playful spirit. With a focus on natural materials, authenticity, and craftsmanship we seek to deliver warm, intimate spaces that cultivate a sense of solace and restoration. We are inspired by the natural world, and aim to enhance this connection in every interior, not only in the selection of materials, but with a focus on maximising light & space wherever possible. Utilising a considered & collaborative approach, we develop and communicate the narrative of the client and blend it with cues from the surrounding landscape, culture, and architectural vernacular to create timeless, honest designs. We are not trend seekers, nor do we own a ‘house style’, but prefer to start each project fresh, with the client brief defining the overall direction. That said, we do not take ourselves too seriously, and enjoy adding a dash of whimsy and surprise where and when we can. Characterised by creative & bespoke solutions, we believe design should reflect how you live and thus, your home should work hard for you. The end result is interior spaces that inspire and delight. We work across a variety of projects with a diverse portfolio from private client homes and consultancy, to luxury developments and retail spaces. By offering our design & development management service, we are able to oversee the entire project, with a proven ability to lead projects ensuring our clients a stress-free and seamless process from concept to completion. Susie Rumbold and her talented team of interior designers at Tessuto have been producing original design solutions for a diverse range of projects and clients for nearly 25 years. Susie's design philosophy is simple. She believes that interior design should be client led and process driven. No two projects are alike; each one being a unique response to the client's brief, and backed up by her team's advanced technical abilities, to execute each project to the highest standard. Susie's studio is located in Parson's Green, in the design district of southwest London, and she has worked on projects all over the world. She is a Past President of the British Institute of Interior Design, and an award winning kitchen designer. Optic Interiors provides an interior design service ranging from 'room remedy' consultations through to full scale refurbishment projects. We comprehensively cover every aspect of interior design offering individually tailored packages to suit any project size or style. Our highly skilled team of professional and creative designers pay great attention to detail, keeping constantly aware of current trends and technical innovations and sourcing from renowned suppliers. Our aim is to bring the project to completion with fantastic results; tailor-made to the clients' needs and desires and budget. Please contact the team to see how we can assist with your project, we'd love to help! Katy SB Design is headed up by Katy Stevenson Bretton, a Scottish born, London based, interior designer. "After 10+ years managing major projects and investments in the public sector, and with a wealth of residential renovation experience, I combined my business skills with my love of interior design, setting up my own company in 2015. My natural eye for design and significant hands-on experience have been bolstered with Interior Design training from Central St Martins and I work with skilled builders and other specialist trades, as well as architects, structural engineers, building control surveyors, party wall surveyors, photographers, stylists and a wide network of suppliers. 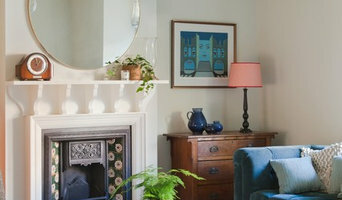 My designs embrace deep colours, natural materials and a beautifully eclectic combination of vintage and contemporary. I have 15+ years project management experience and bring a ruthless attention to detail, however big or small the job." With ten years of experience in the interior design industry and a passion for textiles, Nicky Mudie created Violet & George in 2009 to promote an original and artistic approach to soft furnishings – both in London and internationally. Combining luxury and creativity, Violet & George work with a broad and trusted network of designers, makers, specialists, suppliers and tradesmen to ensure that any design challenge can be solved and that clients receive an unprecedented level of service. They constantly source new and exciting textile designers, samples of which are housed in their extensive fabric library in their North Kensington design studio. Next time you’re in North Kensington, drop in and say hello. We’re on St Helen’s Gardens, not far from Ladbroke Grove tube station. Our vision at Laroya & Co is to deliver outstanding architectural design and interiors solutions centred around our clients' lifestyle and expectations. At the core of our design ethic is to satisfy our clients' needs, but also to create spaces that they can grow into and enjoy for years to come. After achieving her MBA, Reema Laroya decided to follow her passion for architecture and interior design which led her to the prestigious Inchbald School of Design. Her meticulous approach to the discipline earned her commendation by judges and industry stalwarts. Her unconventional creative approach to build spaces around the individuals that inhabit them earned her the internship at Blacksheep, the award-winning design agency that harnesses the power of creative ideas. Widely travelled, Reema has created her own unique style of design that is derived from the many cultural influences that she has been exposed and chosen to immerse herself in to. Michelle specialises in eclectic styles, mixing old with new, different textures and materials to create balanced, unique and beautiful homes. After Graduating from KLC school of design, she has worked on many high-end projects and specialises in bringing out her client’s individual taste and inspiring them to push their creative limits. Inspiring the personal design style of her clients ensures that she is able to create a space her clients are proud of and happy to live in. Her extensive network in product sourcing and product knowledge allows her to maintain the highest level of service while always exceeding her clients’ expectations. Every project begins with an in-depth consultation and continues with open communication from start to finish. Michelle provides a personal service while remaining rigorous to the attention of detail, timelines, and budget. We are a small, friendly, creative studio based in the heart of Chelsea who specialise in designing private residential projects. We bring fresh energy, inspired solutions and original thinking to our work...and we love what we do. Working as collaboratively with our clients as they wish, we are happy designing a single room or taking on the design of an entire house. We work to your budget so you can control the purse strings and be confident that your money is being well-spent. Established over 5 years ago, we have built up relationships with specialist suppliers, talented designer-makers, skilled joiners, and reliable builders. This means we hand-pick the right team for each individual project which allows us to deliver quality results on time and on budget. Spencer & Wedekind are a London based BIID Interior Design Practice; included in Conde Nast, House and Gardens top 100 interior designers. Nicholas Spencer and Sophie von Wedekind are highly admired interior designers. Although based in west London, their outlook is international. Nicholas's boyhood in the US and UK, Middle East and Far East plus Sophie's upbringing amid Anglo-German aristocracy have informed a house style that is English with well-travelled highlights. Their timeless interiors always deliver the reassurance of bespoke craftsmanship with a modern edge. They met at KLC, the country's leading interior design school where both graduated with distinction and awards. Now a husband and wife team, Sophie's touch brings sumptuous textiles and a particular love of pattern; Nicholas specializes in structure and hard materials ranging from industrial chic to refined finishes. Their shared passion is colour, which they always use in a way that sums them up: brave yet tasteful. The results of this union are inventive and elegant interiors that reflect their clients' individuality. Every view delivers a delightful detail that you'll want to touch. Beyond these details, Nicholas and Sophie make homes for the soul. I am passionate about creating interior spaces that surprise and delight through the use of colour, space, light, styling and art. There is no better feeling than handing over a completed space that has been transformed beyond a client's expectations through a joint process that is stimulating, fun and with as little stress as possible. 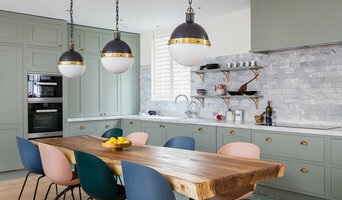 Emily Phillips Interiors is a design practice based in Weybridge, Surrey with a reputation for providing creative, personal and affordable interior design services. We work with residential and commercial clients to offer services tailored to each individual project. From help with choosing colour schemes, sourcing furniture, cushions and curtains through to complete refurbishment, we are able to offer a range of creative solutions to suit any size project and budget. 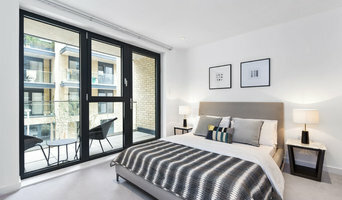 Andrew Jonathan Design is an interior design studio operating in London and the South West with work featured by the London Evening Standard, Ideal Home, Apartment Therapy and 25 Beautiful Homes. My approach is accessible and bespoke. For me, it’s about designing living spaces with an inquisitive attention to detail that ultimately makes you smile, and helps improve how you spend time in your home. I offer interior design consultation for projects big or small. Whether you’re looking for someone to consult on a colour scheme for a certain space, or a full design scheme for your home, I provide a client-led design service that helps you realise your vision.